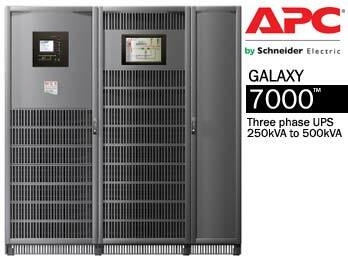 Three-phase Galaxy 7000, 250 to 500 kVA (up to 4 MVA in parallel configurations), includes cutting-edge technologies for high-power applications. Calling on over 40 years of experience in the Critical Power and Cooling Services division of Schneider Electric, the leader in complete, high-quality electrical power solutions, Galaxy 7000 offers optimised performance for data centers, infrastructure and industrial processes. The compact size, back-to-back or back-to-wall installation enables more room to be utilised for other equipments in the technical room than traditional UPS systems. The UPS can be upgraded to ensure available and secure power infrastructure for current as well as future demands. Galaxy 7000 increases the productivity of these applications by providing continuity of service through secure supply solutions that are flexible, adaptable and upgradeable. Galaxy 7000 provides high-quality energy, compatible with all loads, with a very high level of availability. The variety of architectures meets the specific needs of each installation and allows easy upgrading. The communication capabilities and proactive services provided by Schneider Electric, the most complete and available worldwide, make for highly effective maintenance. The strategic and economic importance of data centers made it necessary to set up the ANSI/TIA site typology (TIER I to IV). It presents the necessary functions of the major components, including supply via UPSs, to ensure consistency and obtain a high level of overall availability. Galaxy 7000, through its design and many possibilities for parallel connection, as well as its compatibility with STS (static transfer switch) systems, meets TIER IV requirements for fault-tolerant sites offering the highest level of availability (99.995%). Combined with STS units, Galaxy 7000 can supply energy via two or three different channels for dual or triple-attach applications and also offers supervision, network administration and remote-control solutions. Galaxy 7000 is ideal for the large (over 500 square metre) data centers of banks, insurance companies, internet and colocation services, telecoms, etc. where 24/365 operation is mandatory and preventive maintenance and upgrades must not require system shutdown. Fig. 2. Applications such as data centers, infrastructure and industrial processes. Service continuity is also required for infrastructure (airports, ports, tunnels) as well as the operation and technical monitoring (via SCADA and BMS systems) of shopping centres, hospitals, office buildings, etc. Galaxy 7000 is perfectly suited to the needs of these communicating, frequently upgraded applications thanks to its power ratings, extension possibilities and communication capabilities. Operation in industrial environments requires equipment capable of maintaining processes, without failure, under difficult conditions, including dust, humidity, vibrations, major variations in temperature, etc. Due to its high electrical and mechanical level of performance, Galaxy 7000 meets these specific needs. 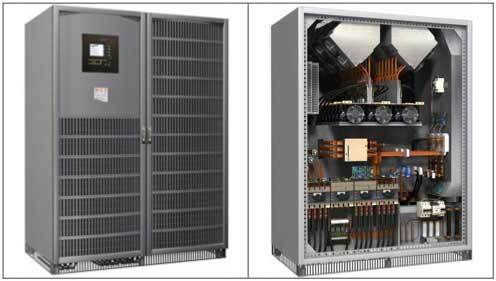 Technical files are available for all the applications specified by design offices, including Ni-Cad batteries for the chemical and petrochemical industries, high IP values, heavy-duty reinforced cabinets, dust filters, marine configurations, rated voltages up to 440 V, etc. The MGE UPS SYSTEMS design office, in conjunction with a specialised industrial organisation, can also handle uncommon conditions, e.g. outdoor installations, anti-vibration bases for marine applications, special paints with the corresponding labels, etc. Galaxy 7000 design combines the best technology (double conversion) with the most recent innovations to supply high-quality power, available 24/365, to high-power applications, whatever the situation in the distribution system. Double conversion technology (VFI as per IEC 62040-3/EN 62040-3). This is the only technology that insulates the load from the upstream network and completely regenerates the output voltage, thus providing high-quality, stable power. IGBT-based, PFC sinusoidal-current input rectifier. The rectifier draws sinusoidal current, without any reactive power, thus avoiding disturbances upstream by reducing harmonic reinjection. • Very low current total harmonic distortion THDI, less than 5%. • Input power factor (PF) greater than 0.99 from 50% load upwards. These performance levels, combined with the three-phase input not requiring neutral, offer substantial savings in terms of cables and equipment. Fig. 3. Three-phase, PFC sinusoidal-current rectifier, with DualPack IGBTs. Battery charger separated from the AC input. The chopper is supplied via the rectifier output and is thus protected against fluctuations on the AC input. Battery recharge is adjusted as a function of the temperature. A check on the phase sequence is run to protect the power system from the effects of incorrect connections. Wide input-voltage (250 to 470 V) and frequency (45 to 65 Hz) range. This is made possible by double-conversion technology and the PFC rectifier which is compatible with all sources and with disturbed distribution systems (voltages as low as 250 V for 30% load). Fig. 4. Wide input-voltage range. • when the normal AC source returns to tolerances, to delay transfer from the battery to the rectifier, thus avoiding excessive variations on the AC source. • in a parallel system, to set up sequential start-up of the inverters. Fig. 5. Soft start walk-in ramp with time delay. Cold start on battery power if the AC source is absent or disturbed, even in parallel systems. • output PF = 09 for all types of load. The range is suitable for the most recent non-linear and computer loads, called capacitive loads, with a leading PF close to 0.9 and a high crest factor. Output voltage adjustable to ± 3% of the rated value (in 0.5 V steps) to take into account voltage drops in long cables. Excellent response to load step changes, < 2% for 100 to 0% or 0 to 100% and return to the ± 1% tolerances within 100 ms.
High current-limiting capacity for inverter short-circuits (2.5 In, 150 ms) to facilitate discrimination with downstream protective devices and accept high crest factors, 2.4:1 up to 3:1, depending on the voltage and power levels. Intelligent thermal-overload capacity curve for better performance. The curve is adjusted as a function of the ambient temperature, 1.5 In / 30 seconds, 1.25 In / 10 minutes. Galaxy 7000 proposes backup times from 5 minutes to 2 hours with a rapid charger (recharge < 6 hours for 10-minute backup time). Backup time remains available due to digital battery management and the protection systems. • the remaining battery life (1). • numerous automatic tests.Fig. 10. Digibat. The B1000 battery monitoring or “Cellwatch” option monitors all battery strings 24/365 and displays a failure prediction for each block. Galaxy 7000 has a control and display interface offering intuitive functions. Based on graphs and pictograms, the interface can be set up in 19 languages including Chinese, Korean, Thai, Indonesian, Turkish and Greek. It includes a graphical display for time-stamped events and useful operating statistics. For operating personnel, that is an essential aspect in facilitating decisions. Simple and user-friendly, the interface enhances safety and comfort. Graphical display with HD, B&W touch screen (SVGA). Menu keys and direct access to display functions. supervisors via the communication cards. Time-stamping of last 2500 events. On-line help to assist with the displayed messages. Galaxy 7000 offers the entire MGE UPS SYSTEMS range of communication systems designed to meet three essential needs. Inform on UPS operation and its environment, warn users, wherever they may be, concerning any potential and existing problems. Actively supervise an entire set of UPSs. • Ethernet 10/100 Mbps using the Https protocol. Life Cycle Monitoring software for optimised maintenance. separate cabinet, can be hot-swapped (with the UPS supplying the load). The UPS can be installed in both technical and computer rooms. The UPS can operate correctly back to the wall or back to back, but it is preferable to leave some space (> 600 mm) for easier maintenance. Leave one meter of free space in front of the UPS for door opening. At least 500 mm of clearance above the UPS is required. Galaxy 7000 UPS units offer the following equipment and functions. pls. send to me ups systems catalog and price list. Please contact your local supplier of APC’s (Schneider Electric) UPS devices. Prices are different from country to country.